What a crazy week it's been. I've been torn between checking the news obsessively to not want to look at it at all. I think everyone, myself included, took a huge sigh of relief on Friday night, but things are still a little tense. In light of all the tragedy going on around us I'm trying to make some time to appreciate the little things. 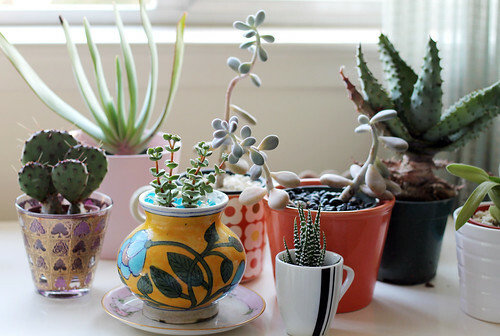 Like my succulent collection basking in the sunshine. I hope you have a great week! Ok, well it's not IN London, but it's close by! 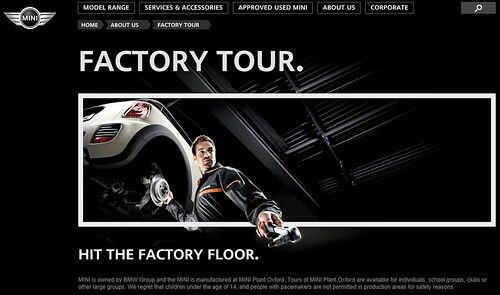 During my trip to the UK I am so excited that I'll be able to stop off in Oxford to take a tour of the MINI factory! It's something I knew I always wanted to do, to see the place where my MINI (Max) and so many others were built. When I was planning my trip, I knew I had to book the tour in advance. So I checked out the MINI UK online booking calendar and was horrified to see that tours were unavailable the ENTIRE time I was in the UK. What?! I was so disappointed and even joked (maybe) with my friend that I would scale the factory fence if I needed to, James Bond style. 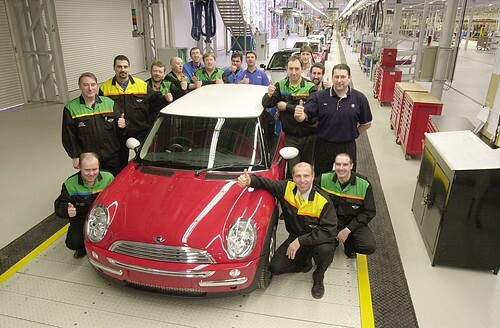 The first New MINI rolls off the assembly line in 2001. My Max would come through just a little while later! Thankfully that won't be necessary, as a tour spot opened up for us! Yay! Even though photography is prohibited inside, I will definitely share my experience with you here. I'm very excited as I've heard nothing but good things about this tour from other MINI peeps. 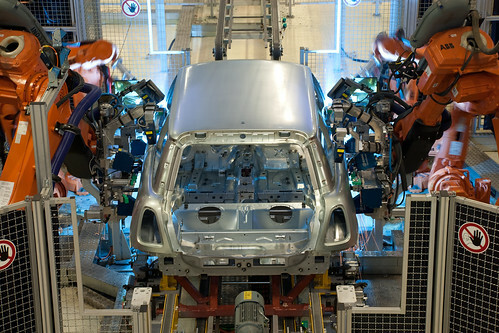 Sophisticated robots do most of the work building MINIs now. 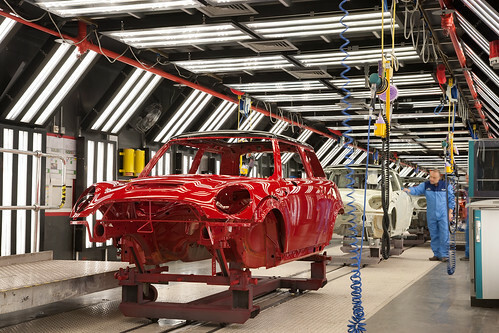 The paint room won't be a stop on the tour, as it's under strict dust regulations! 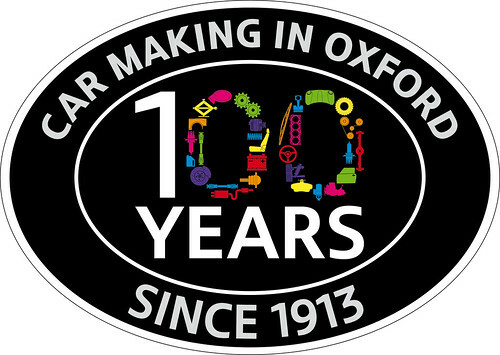 I did a little research and learned that the Oxford plant just celebrated it's 100th anniversary in March! 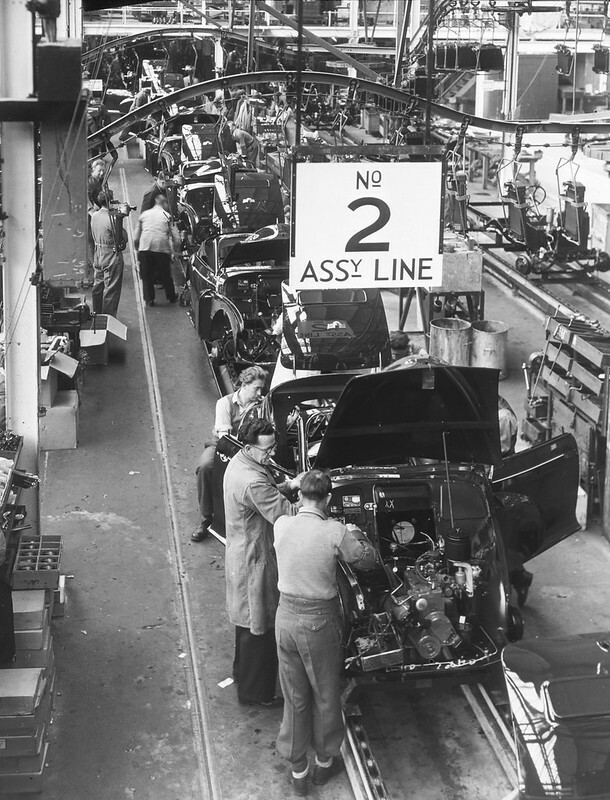 Inside the Oxford Plant in building Morris Minors around 1950. All photos via press.bmwgroup.com from the article referenced above. I've been busy with work this week (a big deadline is now behind me, thankyouverymuch!) and trying to plan for my up-coming trip to London. I'm a nervous flyer, so I've been assembling a list of the best things to put in my carry on bag to put me at ease/keep me busy/help me sleep. I've never written one of those "in my bag" posts, but I think I may have to type something up to share about it. Look for that next week! 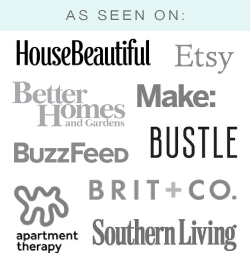 Besides the personal stuff, I've been working on a few new products for the Etsy shop. 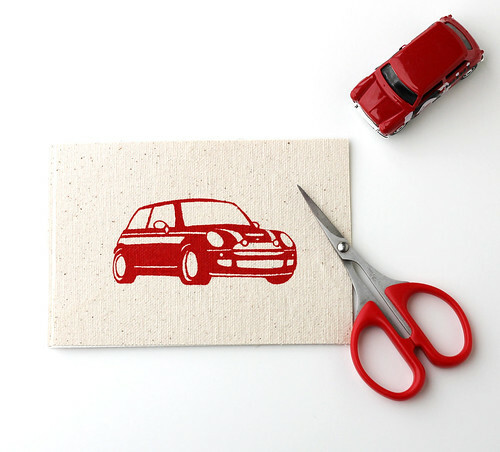 I've got new screen printed MINI Cooper patches on heavy canvas! I have them available in red, navy blue, and black so far, and available with or without iron-on adhesive on the back. 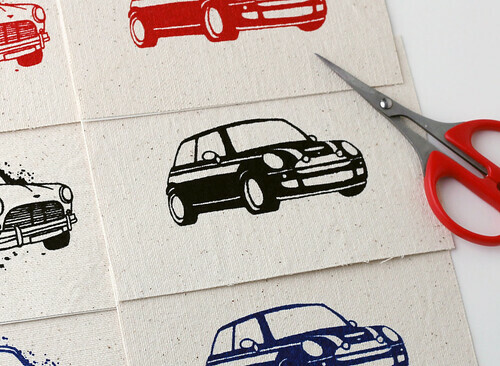 I also have these printed with the Classic Mini design as well. Put a MINI on it! 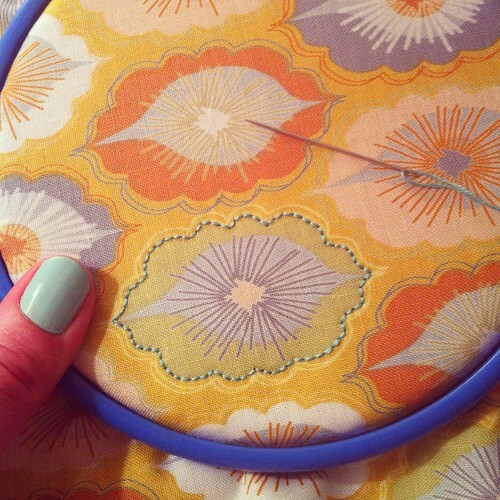 New colors in the Little MINIs fabric! 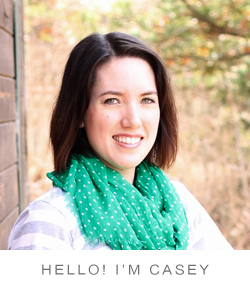 Now in Spicy Orange and British Racing Green. You can find those in the shop. 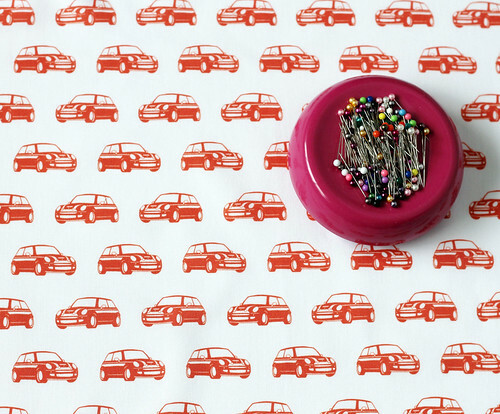 Isn't that fabric print great? I bought a 1/4 yard on a whim the other day and am pleased that I've already found a use for it. I hope you have a great weekend! I can't believe time the is just flying by: I leave for London in 13 days! I have a few things planned so far, but one stop on my must-see list is LIBERTY! 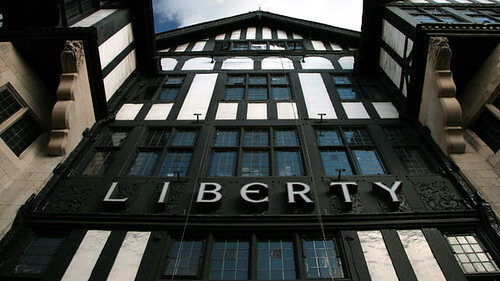 Liberty is an iconic London company and holds an important place in the history of fashion fabric design. My guidebook says that the first Liberty show was opened in 1875 selling oriental silks. 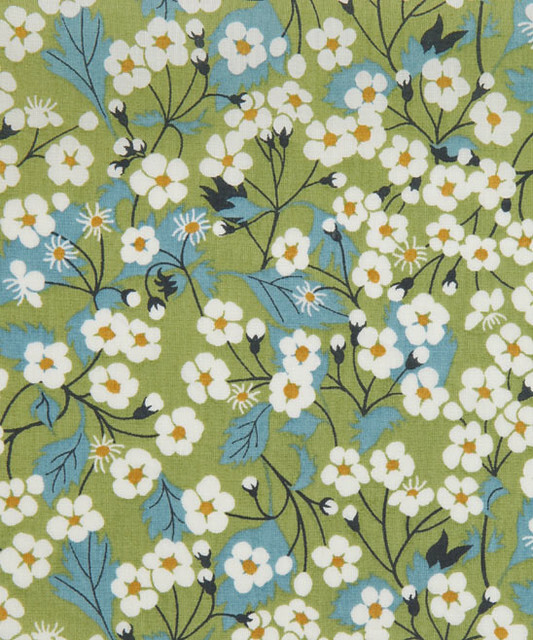 Soon after, they began selling fabric prints (all made in England) that have become quite iconic. Check out this video showing their printing process. 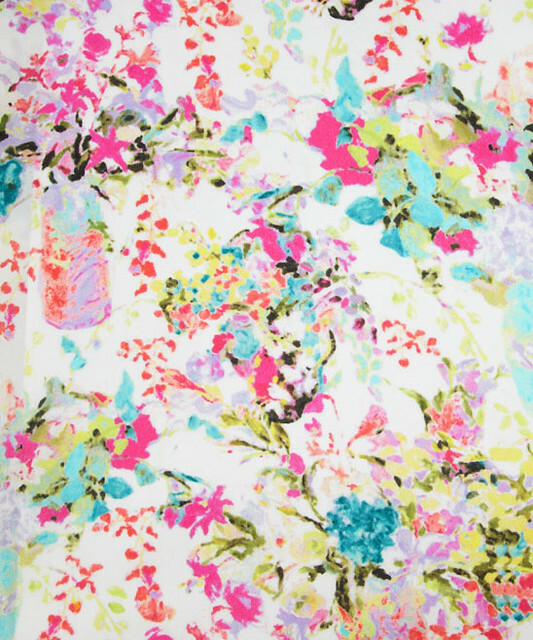 I've saving my pennies for some Liberty fabric to call my own. 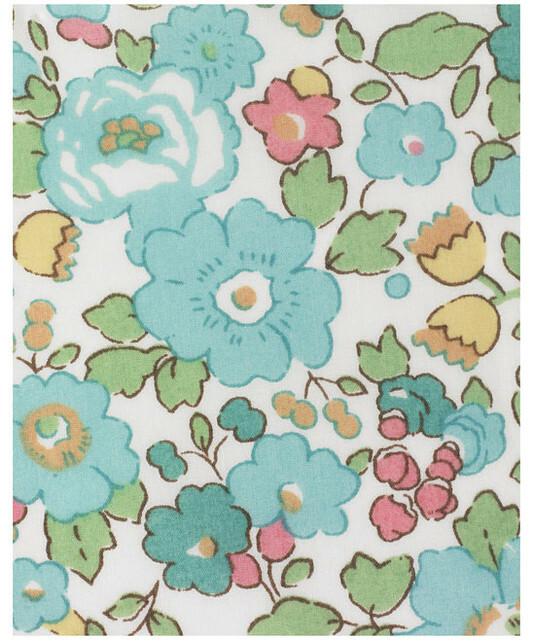 I plan on buying a couple pieces to add to my fabric hoard that I may or may not ever make something out of. Does anyone else do that? 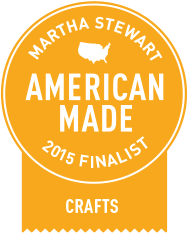 Buy beautiful pieces of fabric to just look at, and enjoy? I think the more important question is: How the heck will I choose? 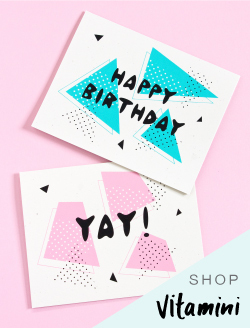 I already want all the prints! Funny enough, the day after I bought my plane ticket I saw an announcement on Twitter that this book, "Liberty Love" was coming out. 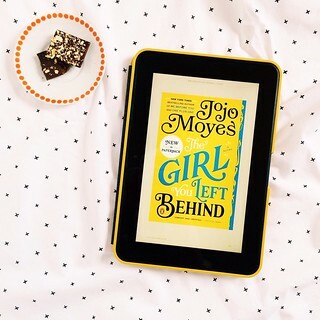 The projects look modern and fun, and the book has a MINI on the cover! Come on! You can find other Liberty themed books on Amazon. 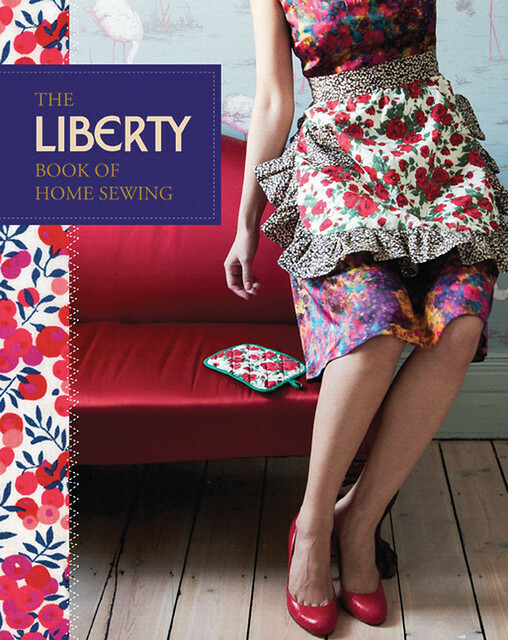 "The Liberty Book of Home Sewing" sounds like another good one. 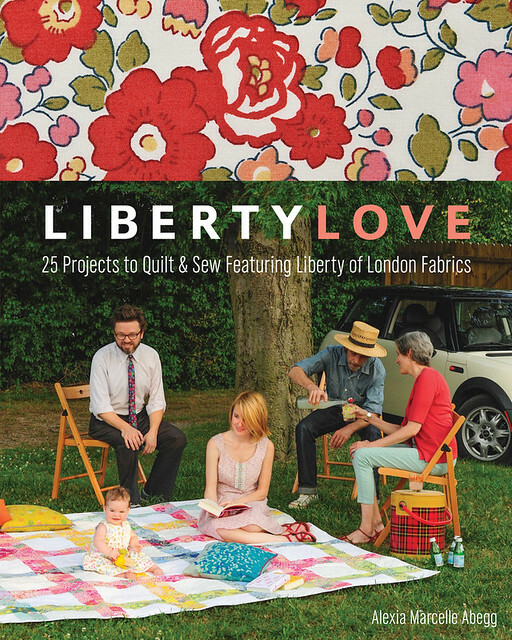 Do you have any Liberty fabric? Do you have the courage to cut into it and make something? 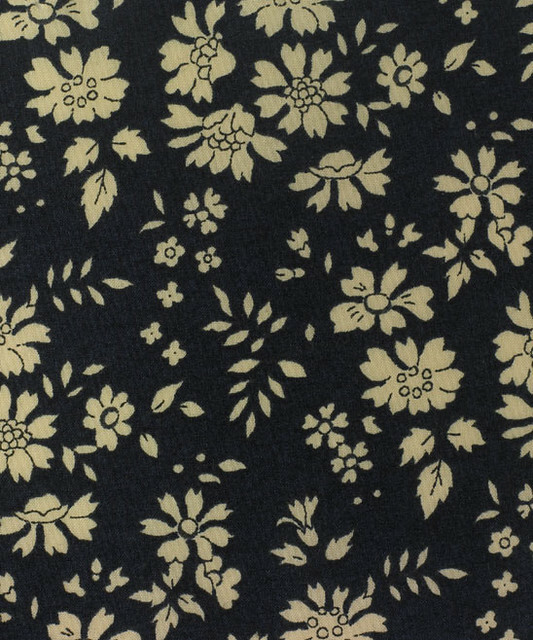 *Fabric print images from the Liberty website. In this elevabor bank we experience some graphic opposites. 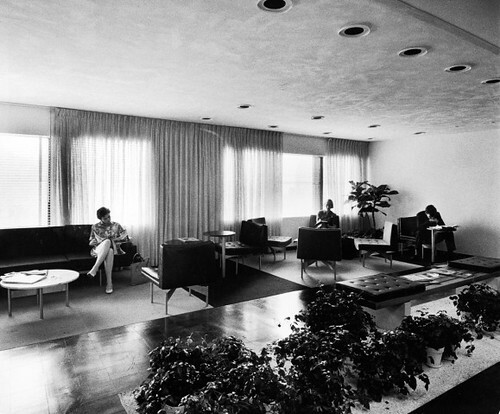 The lady in the background in the black and white polkadot dress is a nice touch, as are the white blooms on the plant shelf. 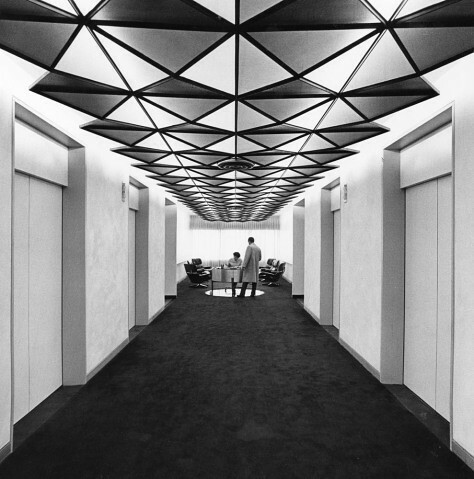 Simple floors and walls draw attention to the dynamic pattern on the ceiling. 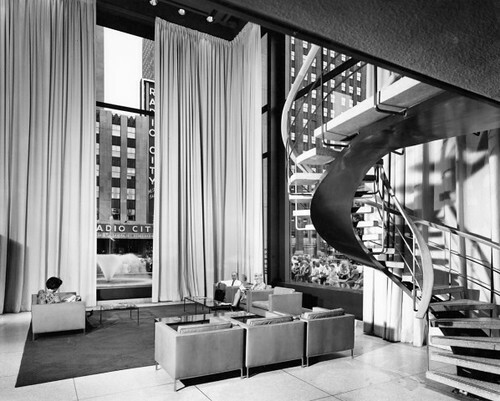 If elevators aren't your bag, try using a sweeping staircase instead. This one offers views of Radio City. 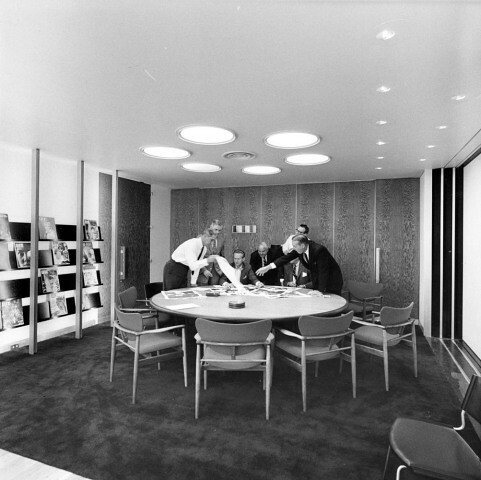 When the men need to get down to business, they can gather in this plush conference room. I like the circular cluster of ceiling lights mimics the shape of chairs around a table. They must have hid the afternoon cocktails in this shot. 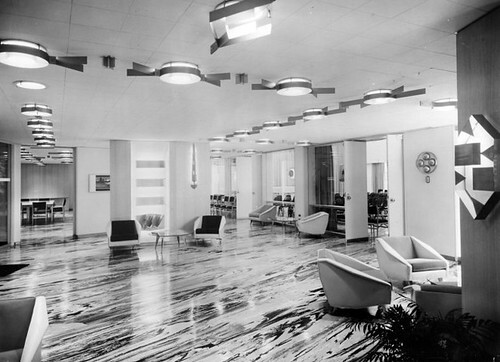 Here's one of the jazzier lobbies, with its futuristic furnishings, bold patterned floor, and artistic light fixtures. 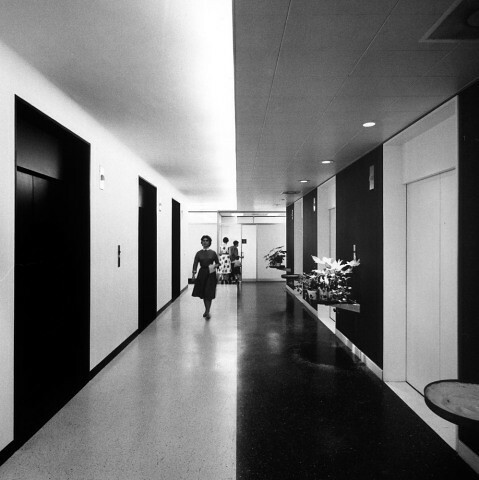 Check the entire post and all of the photos of the Time & Life Building in the 60's. 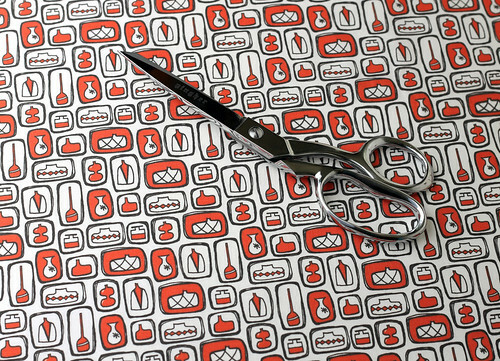 If you're looking for a little paper crafting to keep you busy till Sunday, check out these great Mad Men Paper dolls (and other wonderful MM illustrations) from Dyna Moe, via Mad for Mid-Century. 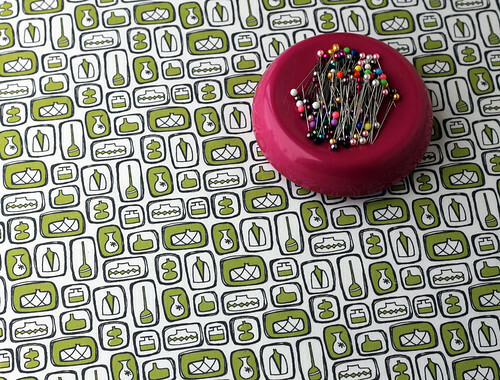 I'm so happy to share my brand new Retro Vases fabric! 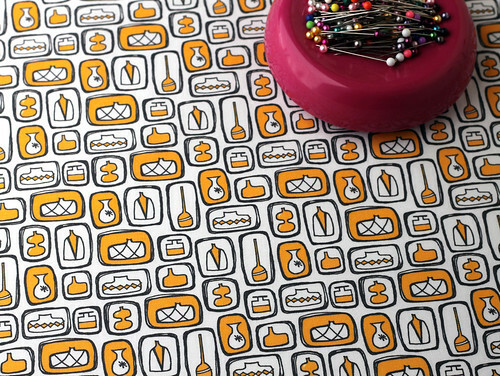 The design consists of my hand-drawn collection of mid-century glassware. Piecing all of the shapes together to create a continuous repeat was quite a brain teaser! 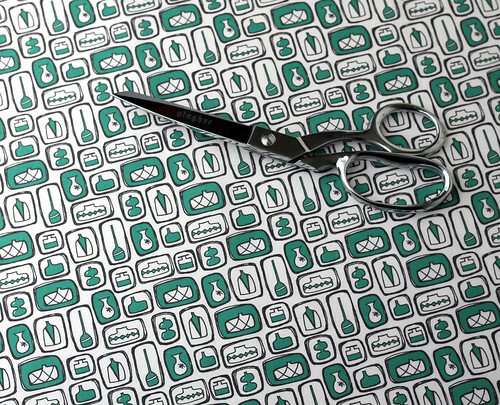 But once I had it figured out, I sent it off to have the good folks at Spoonflower print it up for me in some of my favorite retro-tastic colors. 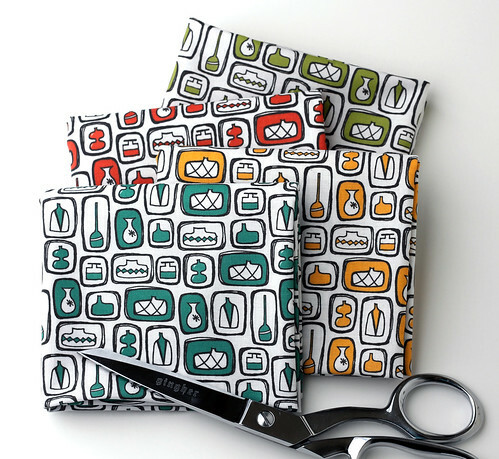 In addition to the usual quilt, bag, or accessory project, I'm thinking these prints would make really cute kitchen accessories: hot pads, oven mitts, maybe a french press cozy. 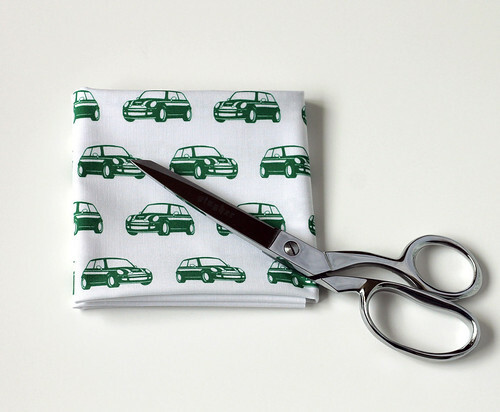 Check out the fabric section in the Vitamodern shop on Etsy.